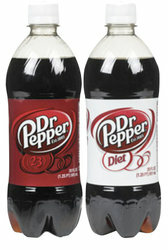 Dr. Pepper Products in the 20 oz Bottle. A truly unique product. Many have tried to imitate, but none can duplicate the popularity of this all american product. Buy Them Individually or 24 At a Time for Full Cases.